But these days, Tennyson is one of coach Phil Housley’s most trusted defensemen. In Saturday afternoon’s 3-2 loss to the San Jose Sharks, Tennyson played just over 21 minutes, his highest total since Feb. 15, 2015, a 93-game stretch. A wild string of injuries have pushed Tennyson into a role larger than most expected. Right now, four Sabres defensemen – Nathan Beaulieu, Zach Bogosian, Justin Falk and Josh Gorges – are sidelined. Bogosian and Falk haven’t played yet this season. So Housley has kept leaning heavily on Tennyson, using him to kill penalties and play a point on the power play. Those duties have helped Tennyson skate more than 18 minutes in eight of the last nine games. The injuries have forced Housley to juggle combinations and rely on his top defense duo, Rasmus Ristolainen and Marco Scandella, a lot. Both skated more than 25 minutes last game. Due to the rugged nature of the position, defensemen are always at a premium. The Sabres have already used nine defensemen through the first 12 games. For some perspective, they used nine defensemen all of 2015-16, and the last one they recalled, Chad Ruhwedel, played one game in March. They used 12 last season. Tennyson, who has zero points in 12 games, has settled on the second pair beside Jake McCabe. Tennyson appreciates the confidence Housley has shown in him. Housley kept putting Tennyson out Saturday after his gaffe at the blue line – he missed the puck after his stick got caught on the boards – led to Joonas Donskoi’s breakaway goal out of the penalty box. 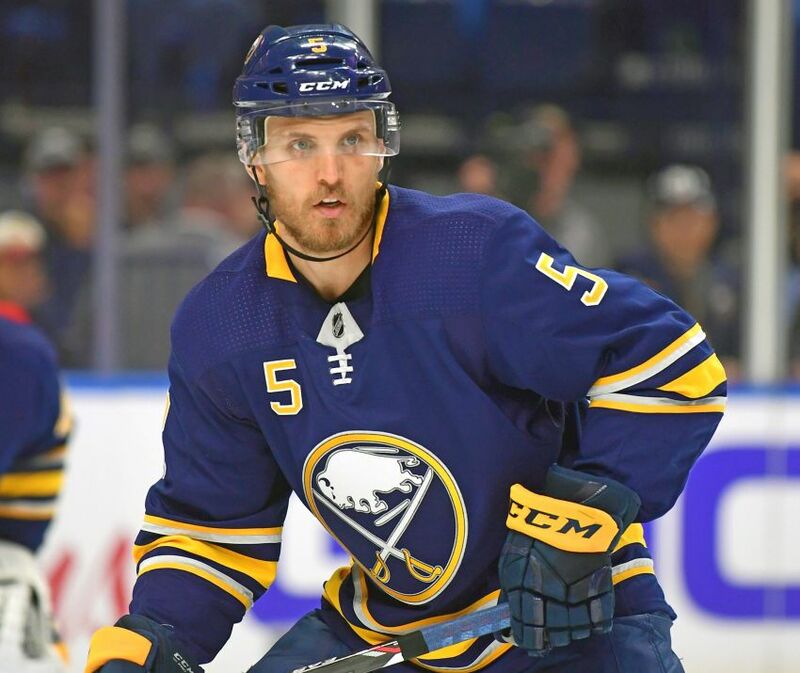 The entire group – the Sabres have also relied on rookie defenseman Victor Antipin and recent recalls Taylor Fedun and Zach Redmond – has “responded real well,” Housley said. Of course, the defensemen must start contributing offensively. The Sabres are the league’s only team without a goal from a defender. The blue line has combined for just 12 assists. Housley has stressed all season the Sabres must possess a shot mentality. Update: The Sabres sent Redmond to the Rochester Americans today. Redmond’s assignment likely means Falk, sidelined all season with a lower-body injury, is ready to return. Falk started practicing again last week. Redmond, who joined the Sabres earlier this month, played two games with the big club. He started the season in the AHL. He’s the worst defenseman in the NHL…and the fact that Housley has him on the power-play is downright laughable. Can’t wait until he’s replaced…Zach Redmond too, who’s even worse. *You LOVE writing about garbage players like Tennyson, Moulson, Nolan, Gorges, Griffith, Redmond…all the players that fans can’t wait to see gone.